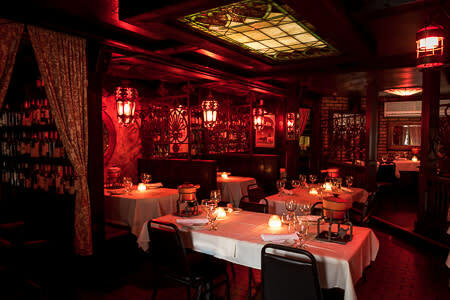 Chicago's legendary fondue restaurant featuring romantic fondue dining with classical/flamenco guitarist is celebrating 54 years. Enjoy the Swiss Gruyere cheese fondue to entree fondues including shrimp, scallops, lobster, chicken, and beef. For dessert, the Belgain flaming chocolate fondue is a treat. Hours: Mon.-Thurs. 5pm-10:00pm; Fri. 5pm-11pm; Sat. 5pm-11pm; Sun. 4pm-9pm. Res. Accptd., Valet, AE, V, MC, DC, $$$.